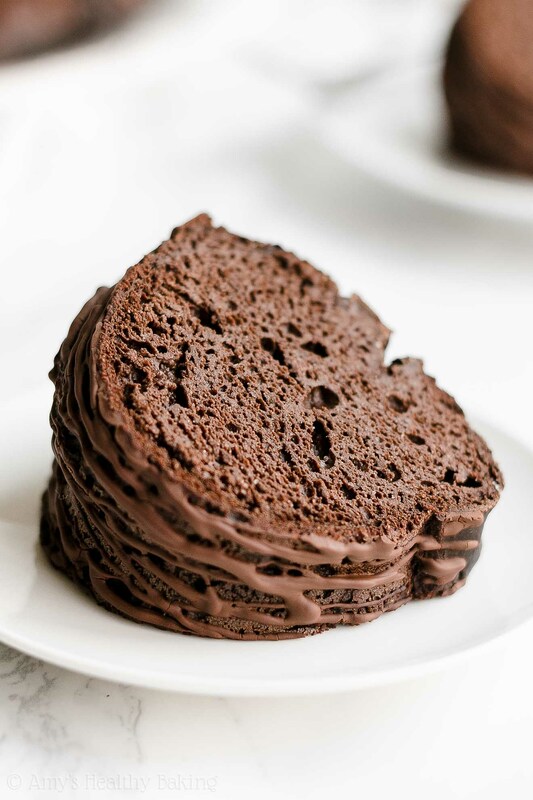 Learn how to make the best ever chocolate bundt cake! 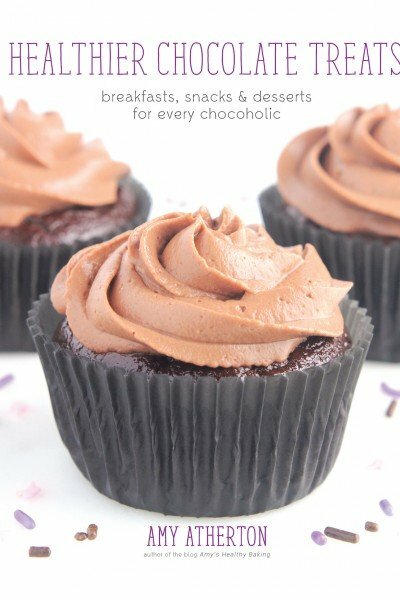 It’s extremely rich and chocolaty, even with no refined flour or sugar. Just 96 calories too! 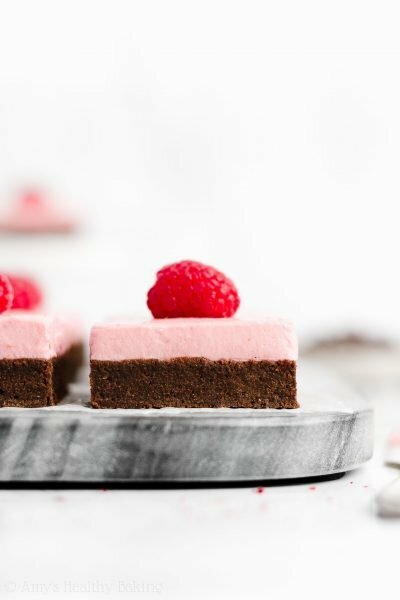 It tastes like a combination of chocolate cake and brownies—I’m totally obsessed!! While in Arizona visiting my grandparents a couple of weekends ago, my mom reminded us that our aunt’s birthday fell on that Saturday. Mom dashed out to Target for cards and a gift, while my brother and his best friend borrowed Grandma’s car to drive to the store for dessert. And Mom replied to get all of them! So after lunch, we gathered around the assortment of desserts to sing happy birthday and give my aunt the first choice of treats. Out of the flan, regular tres leches cake slice, chocolate tres leches cake slice, and the miniature two layer chocolate cake, she opted for the flan. Mom and I secretly cheered. More chocolate cake for us! Yet as I slid the first bite into my mouth, I felt a tinge of disappointment. The cake tasted really sweet… But not very chocolaty at all. It had a very muted chocolate flavor, borderline bland, and I actually scraped off the frosting. Pretty disappointing. 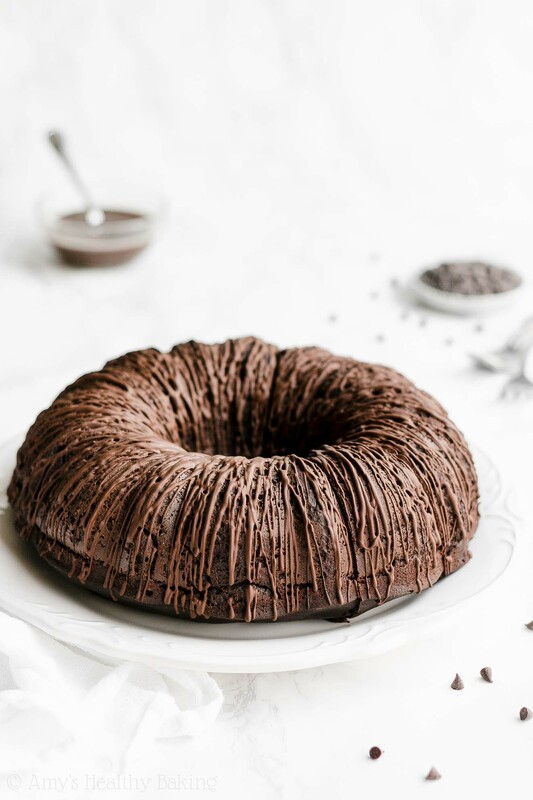 So when I arrived back home, I baked this Ultimate Healthy Chocolate Bundt Cake to get my chocolate cake fix! It’s the exact opposite of that grocery store chocolate cake: supremely rich, incredibly decadent, and extremely chocolaty. It tastes a little fudgy too, as if you combined chocolate cake and brownies together into one dessert! 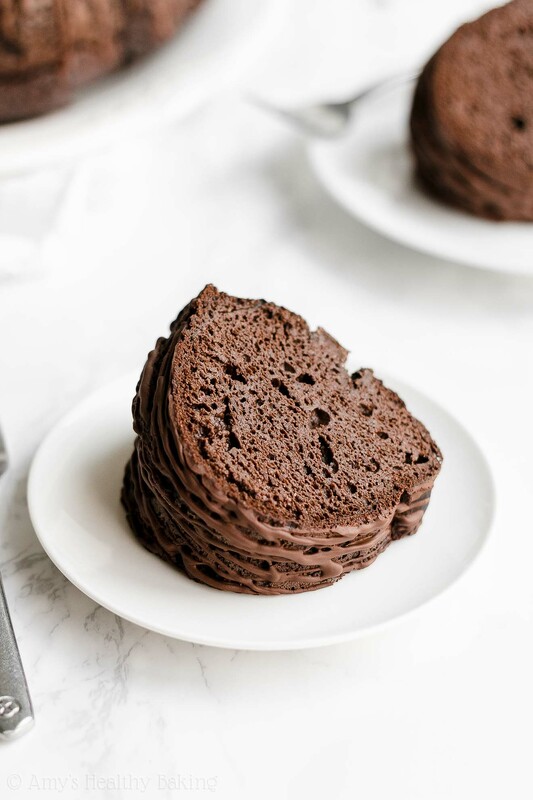 And also unlike that grocery store version… This ultimate healthy chocolate bundt cake contains no artificial ingredients, refined flour or sugar and only 96 calories in a slice! I definitely went back for seconds of this homemade chocolate cake! ? 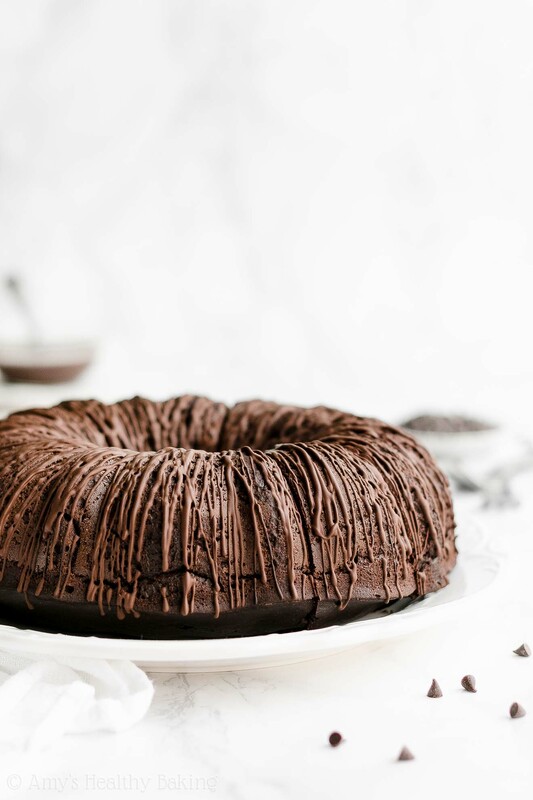 Let’s go over how to make this ultimate healthy chocolate bundt cake! You’ll start with a combination of unsweetened cocoa powder and whole wheat pastry flour. You just need the regular kind of unsweetened cocoa powder, like this. I’ve found that Dutched or “special dark” cocoa powder doesn’t taste as strong in this particular cake and leads to a more muted chocolate flavor. Then to ensure this ultimate healthy chocolate bundt cake tastes really rich and decadent, you’ll actually use more cocoa powder than flour! Whole wheat pastry flour is made by finely grinding a special type of soft wheat. It has the same health benefits as regular whole wheat flour (like extra fiber! ), but it has a taste and texture closer to all-purpose flour. 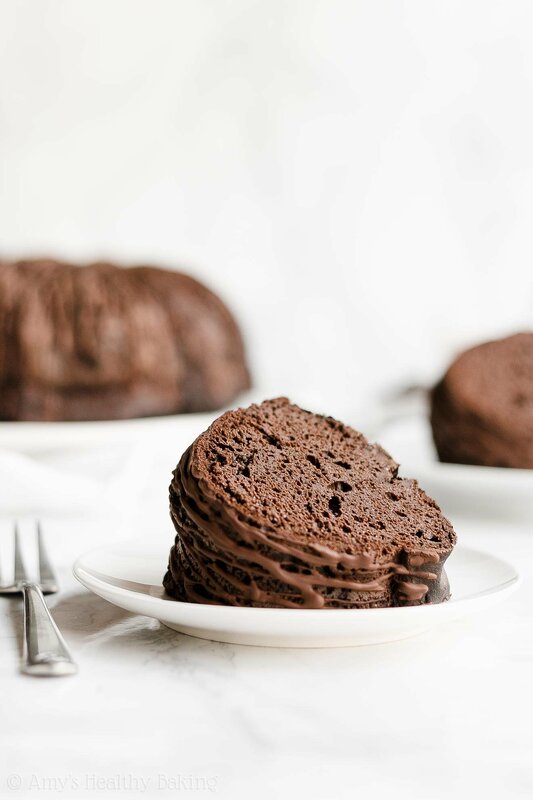 That difference is what allows the moist and fudgy texture, along with the incredibly rich flavor, of your ultimate healthy chocolate bundt cake to truly shine! Just remember, it’s extremely important to measure the cocoa powder and flour correctly, using this method or a kitchen scale. (← That’s the one I own and love!) Too much of either ingredient will dry out your cake batter, and too much cocoa powder will make your cake taste bitter, instead of rich and decadent. I promise it’s worth the extra time to measure properly! Whereas many traditional chocolate cake recipes call for lots of melted butter or oil (I’ve seen anywhere from ½ to 1 full cup!) to keep them moist, you just need 1 tablespoon for this one. 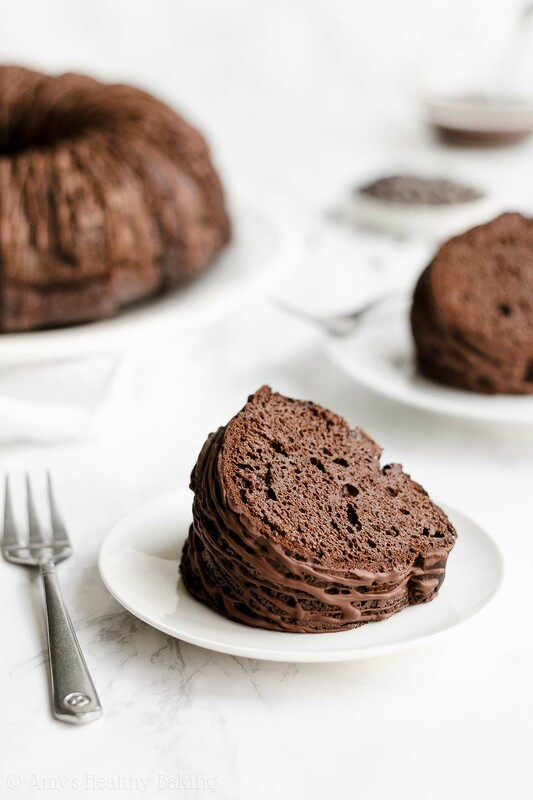 That shaves off anywhere from 712 to 1,527 calories—and that really helps keep this ultimate healthy chocolate bundt cake low fat and low calorie! Greek yogurt! Greek yogurt adds the same moisture to your cake batter as extra butter or oil but for a fraction of the calories. It also gives your ultimate healthy chocolate bundt cake a protein boost! 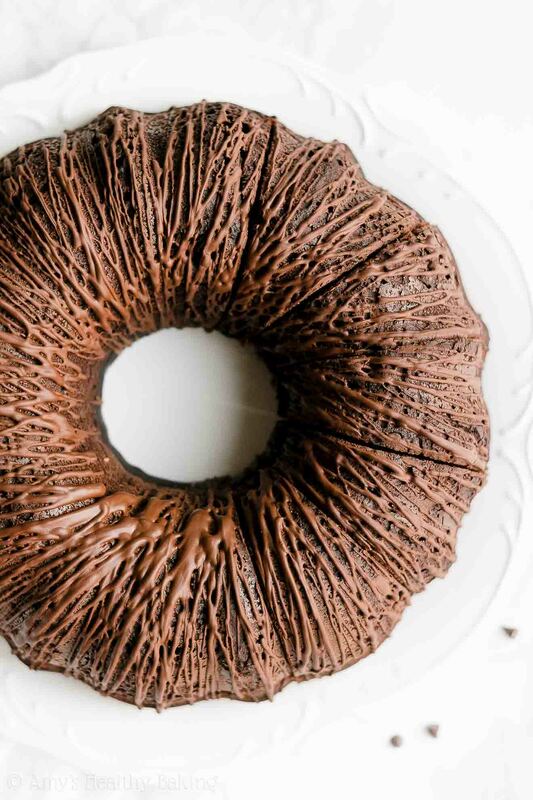 Protein-packed healthy chocolate bundt cake… Does that make it breakfast food? ? White vinegar! It may sound like a strange ingredient for chocolate cake, but it’s actually the secret ingredient in this one. The vinegar (an acid) reacts with the baking soda (a base) to create air bubbles. 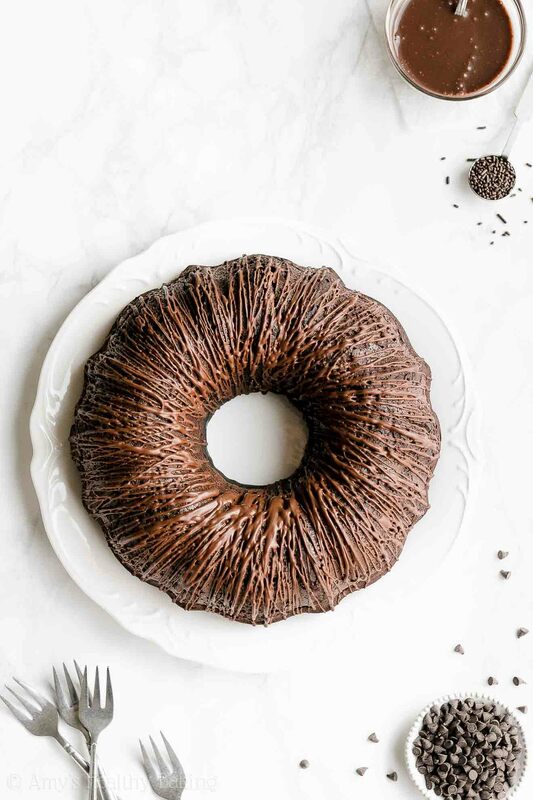 Those air bubbles make your cake rise, and they also give this ultimate healthy chocolate bundt cake a deliciously moist and fudgy texture. I love nerdy baking chemistry like that! To sweeten your ultimate healthy chocolate bundt cake, you’ll actually use two ingredients: liquid stevia and erythritol. 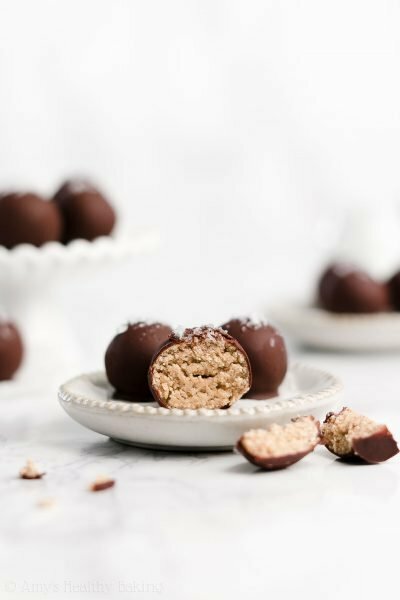 Both of these ingredients are plant-based, no-calorie sweeteners that contain nothing refined or artificial (aka they’re clean-eating friendly!). I actually buy both online (here for the liquid stevia and here for the erythritol!) because that’s where I’ve found the best prices. Tip: You’ll use liquid stevia in all of these recipes of mine and erythritol in all of these recipes of mine too! So I promise it’s worth buying and using both! Your cake batter is almost done! At this point, it’d time to stir the cocoa + flour mixture into the Greek yogurt mixture. However, instead of dumping one bowl into the other, you’ll actually use a method called alternating additions. This simply means that you’ll alternate between adding a little cocoa mixture, gently stirring it in, adding a little milk, stirring it in, going back to the cocoa mixture, gently stirring it in… And continue until you run out of cocoa mixture and milk! Alternating additions are key because they prevent overmixing. 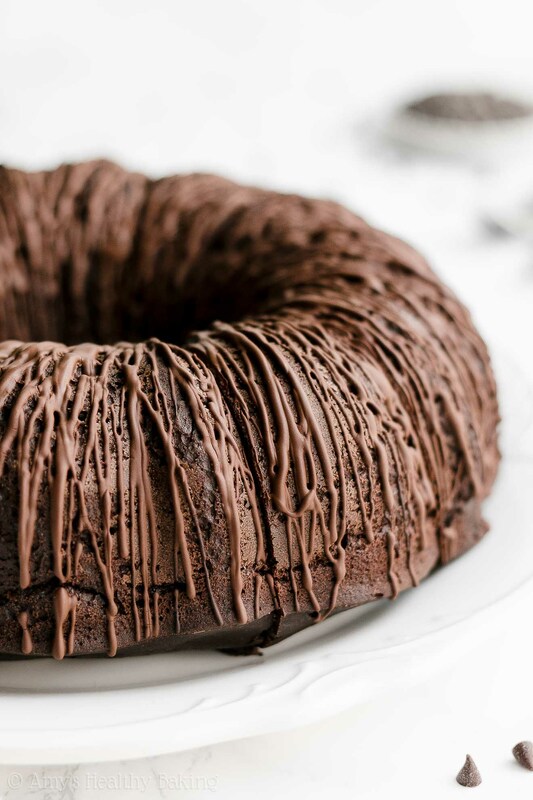 Overmixing the batter results in a tough or gummy texture, instead of the perfectly moist and fudgy texture you want in your ultimate healthy chocolate bundt cake. Hint: This is why I highly recommend against using an electric or stand mixer! They tend to overmix healthy batters like this one. Use a whisk where instructed and a fork for everything else for the best texture! Now your cake batter is ready to bake! Before pouring it into your cake pan, make sure you generously coat your bundt pan with cooking spray. Bundt pans have a lot more nooks and crannies compared to the smooth sides of round, rectangular, or loaf pans. If you don’t coat all of those nooks and crannies with cooking spray, your cake won’t slide out onto the cooling rack when it’s done baking. And if that chocolaty cake goodness just isn’t enough… Then you can add a dark chocolate drizzle on top! It’s super simple to make. Just stir together a little more cocoa powder, some pure maple syrup, and a touch of milk. Transfer that to a zip-topped bag, cut off a tiny piece of one corner, and drizzle it all over your cooled ultimate healthy chocolate bundt cake. Then if you can figure out how to stop after just one slice… Tell me your secret. Because I definitely can’t! ? And when you make your own, remember to snap a picture and share it on Instagram using #amyshealthybaking and tagging @amyshealthybaking IN the photo itself! (That guarantees I’ll see your picture! ?) I’d love to see your ultimate healthy chocolate bundt cake! This is my all-time favorite chocolate cake recipe—it’s the best chocolate cake I’ve ever had! It’s incredibly rich and decadent, similar to 72% dark chocolate, and it tastes like a cross between supremely moist cake and really fudgy brownies. Absolutely delicious! The cake is best if served very soon after it’s been drizzled, but leftovers will keep for at least five days (if not longer!) if stored in an airtight container in the refrigerator. Spread the batter into the prepared pan. Bake at 350°F for 65-75 minutes or until the top feels firm to the touch and a toothpick inserted into the center comes out clean. Cool in the pan for 10 minutes before transferring the cake to a wire rack to cool completely. Once the cake has completely cooled to room temperature and just before serving, prepare the drizzle. Stir together the cocoa powder, maple syrup, and milk in a small bowl. Transfer the mixture to a zip-topped plastic bag, cut off a tiny piece of one corner, and drizzle over the cooled cake. Notes: For the gluten-free flour, use the following: 1 cup (120g) millet flour, ½ cup (60g) tapioca flour, ¼ cup (30g) brown rice flour, and 1 ½ teaspoons xanthan gum. Most store-bought gluten-free flour blends (like this one!) will work as well, if measured like this. White whole wheat flour or all-purpose flour may be substituted in place of the whole wheat pastry flour. Regular whole wheat flour may be substituted in a pinch, although the cake will be less tender and have a distinct wheat-y flavor. It’s extremely important to measure the cocoa powder and flour correctly, using this method or a kitchen scale. (← That’s the one I own!) Too much flour will dry out your cake and give it a crumbly texture, instead of having it turn out moist and tender! 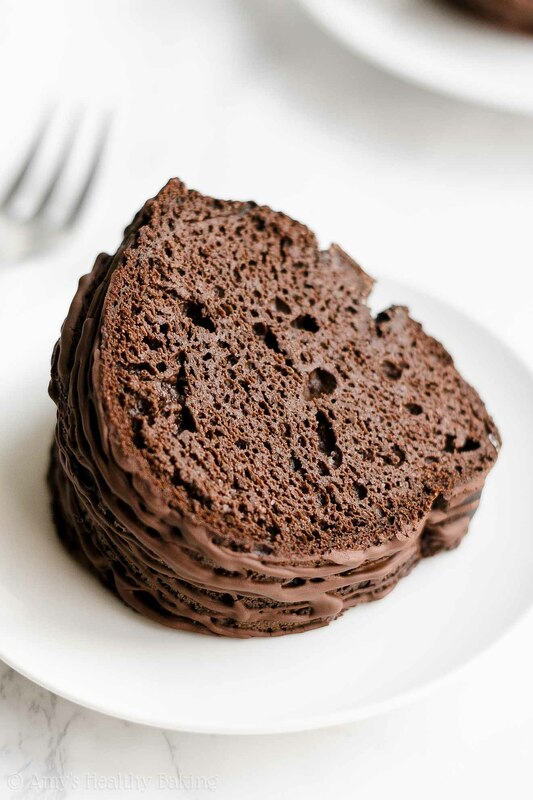 Too much cocoa powder will also make your cake taste bitter, instead of rich and decadent. I do not recommend substituting for the liquid stevia, if at all possible. (It’s one of my favorite ingredients, and you’ll use it in all of these recipes of mine, too!) I buy it online here. However, if you really prefer to omit the liquid stevia from the cake, substitute 2 ¼ cups (432g) granulated sugar and reduce the milk to 1 cup (240mL), but the cake will no longer be clean-eating friendly. You may substitute 2 ¼ cups (432g) coconut sugar and reduce the milk to 1 cup (240mL) to keep the cake clean eating friendly. The baking time may vary with either of those substitutions as well. Do not substitute honey, maple syrup, or agave because the cake batter will be much too liquidy with any of those. Honey or agave may be substituted for the pure maple syrup in the drizzle. For more drizzle, double the drizzle. If you have a 6-cup bundt pan, you can make a half-recipe and bake at 350°F for 60-70 minutes instead. When refrigerating leftover slices of already drizzled bundt cake, the drizzle will turn brittle and crack. It won’t affect the flavor—only the appearance! 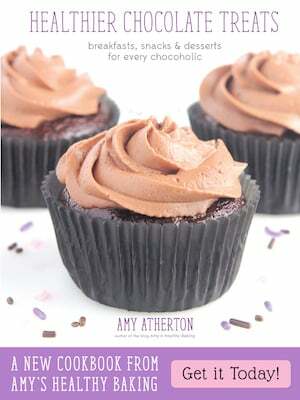 ♡ …and the rest of Amy’s healthy chocolate recipes! OMG Amy! This looks divine! I am making this cake on the weekend and I will post on Instagram (I will remember to tag you in pic and use your hashtag). You’re too sweet Carmelina — thank you!! That means so much to me! ♡ I can’t wait to see your cake and hear what your family thinks of it! I have liquid stevia, but not erythritol! You’ve mentioned I could substitute with coconut sugar (which I have). Could you tell me how much coconut sugar will I need in addition to liquid stevia to make up for erythritol? I really appreciate your interest in my recipe Prajakta! I’ve actually covered that in the Notes section. I know it can be easy to miss! (If I don’t provide a different measurement in the Notes section, then you can assume it’s a 1-to-1 substitution, like with this instance of the coconut sugar in place of the erythritol! 😉 ) I’m so excited to hear what you think of this cake! I’m so glad you’re enjoying my recipes Marcella — that means the world to me!! I’ve actually covered the answer to your question about the difference between those flours in the blog post above the recipe. I know it can be easy to scroll right past that! 😉 I’ve also covered the best alternatives to the whole wheat pastry flour in the Notes section of the recipe. I know it’s easy to miss that too! 🙂 I can’t wait to hear what you think of this cake! Hi Amy. The cake looks wonderful! I have 2 questions. 1. We can not have dairy . I can sub almond milk for the milk, but what about greek yougurt? Can I sub apple sauce instead? What would be the measurement? Another option I was thinking about is coconut yogurt, but it’s not non fat, so I would be adding calories. 2. I have spelt flour, can I use that instead of whole wheat pastry? I truly appreciate your interest in my recipe Batia! Your coconut yogurt would be the best substitute for the Greek yogurt. 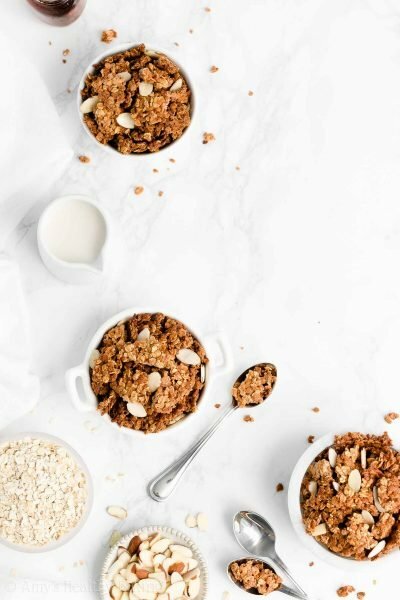 If you’re concerned about the added fat and calories, then try using half coconut yogurt and half unsweetened applesauce (so 6 tablespoons of each). The texture may be different if using half of each, so just keep that in mind! I don’t have much experience with spelt flour, so I’m not sure. However, I think other readers have had decent luck with substituting it in some of my cake recipes before, although I can’t personally vouch for that. 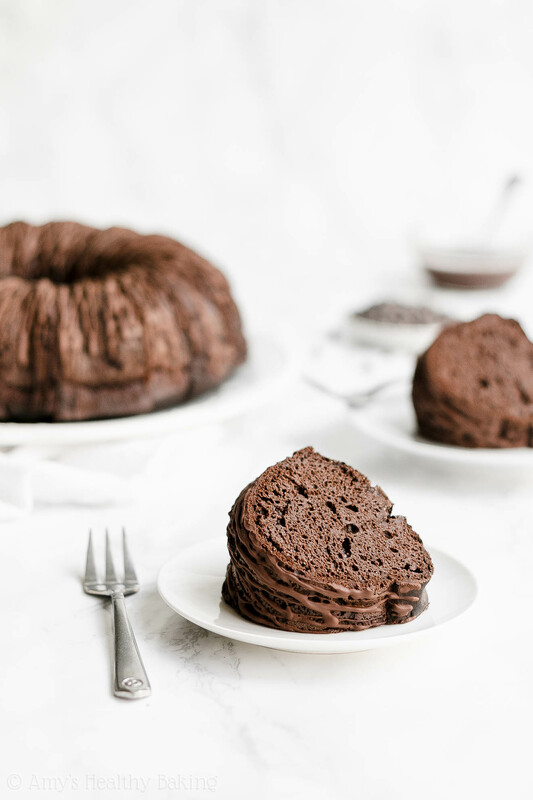 🙂 I’d love to hear what you think if you decide to try this chocolate bundt cake! I don’t have a bundt pan… What can I use instead?? I really appreciate your interest in my recipe Pagie! I think you may be the same person who asked this earlier today on my Instagram photo? 🙂 If so, then what I said earlier still applies — an angel food cake pan would be the best alternative! If you don’t have that either, then cupcakes would be the next best thing! Bundt cakes bake differently than any other cake pan (they’re exposed to air around the outsides and inside of the pan, whereas other cake pans are only exposed on the outsides), so I’m not 100% sure whether another cake pan would work. 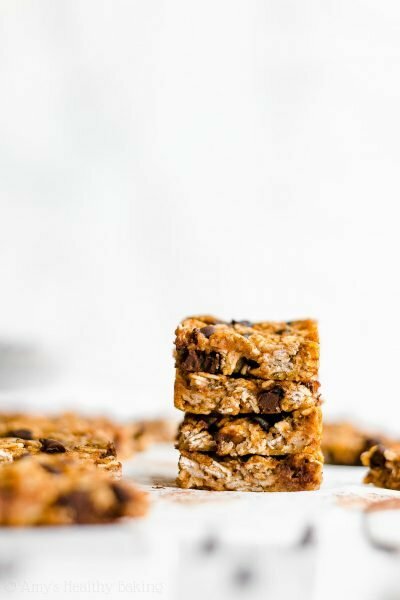 I’d love to hear what you think if you try this recipe!